What Does “Social” Really Mean Anyway? ﻿﻿Inspired by a Harvard Business Review article, “The Devolving Meaning of Social Media” and a blog post reaction to that article by Matt Cheuvront, I decided that I needed to turn to the dictionary for answers. Why? 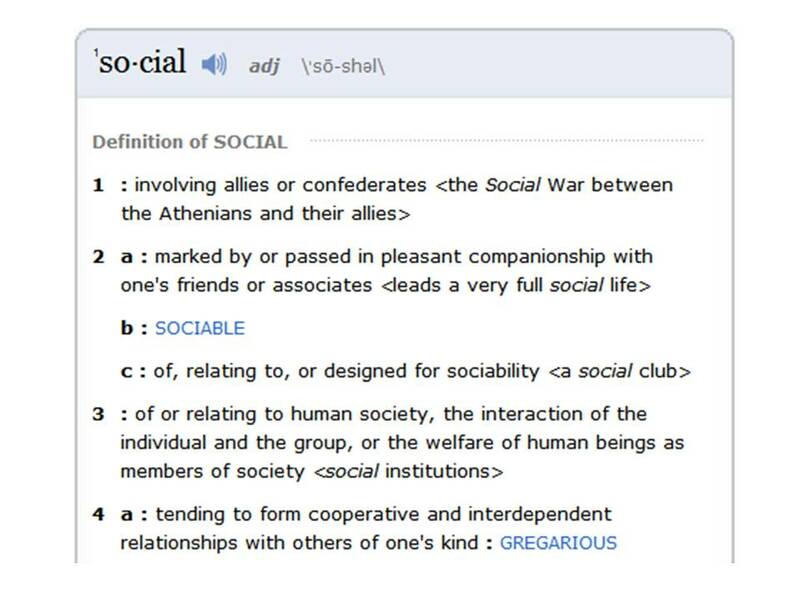 Because these people are bringing up some great points – what does social really mean? And, has the definition been tainted by the hype of social media? The last one is my favorite. It gets right to the point: forming two-way relationships with your niche audience. There you go marketers. Merriam-Webster just schooled us. The point here is that this definition came from the dictionary. It didn’t come from some “expert” or “guru” trying to give you the secret to social media marketing success (because there is no secret). It’s taking a basic principle and applying it to today’s technology and forms of communication. People have always been social and will always have an inherent need to connect with one another, but now a main way we do this is via social media platforms. Apply that to marketing. The idea of a consumer wanting to make a personal connection with a brand has always been there. All social media does is provide the tools for making that connection. Those tools will continue to evolve and change many times over, but social networking (in some form or another) is here to stay because in its simplest form it’s just…socializing. So before you get all caught up in “doing social media,” just take a step back and really think about what social actually means. It’s the core definition of the word that really drives the use of social media for marketing purposes, not the other way around.